Squirrels can be cute, but they can also be a nuisance. Watching them race through the branches of an old tree is always a charming sight – finding a nest in your loft insulation isn’t so much. Squirrels can cause a lot of damage. They can chew their way into your home, tear up insulation and gnaw through electrical cables. Like most rodents they gnaw constantly to keep their teeth in shape and can cause immense damage. They also raid garbage cans and bird feeders. Occasional visits by squirrels are entertaining but if they set up residence on your property you need to get rid of them. The first line of defense against squirrels is keeping your home and outbuildings secure. Replace any rotted boards, and fix up loose ones. Close any gaps that give squirrels access. If you need to leave any openings for ventilation close them with steel mesh; make sure it’s solidly tacked in place. Caulking or foam can be used to seal smaller holes. Most often squirrels get into your house through the roof, so try to keep them off it. Cut back any branches that overhang the roof or come close enough for a squirrel to jump. 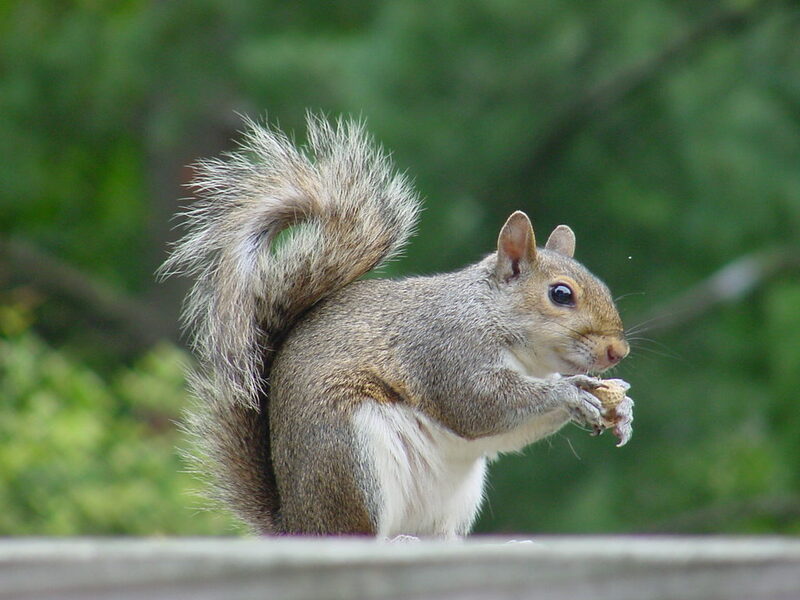 Fit guards on any cables that run to your home; a phone or power cable is an overhead highway for squirrels. Make sure you check lofts regularly for any sign of nests or a smell of urine, and investigate any suspicious discoveries – scraps of insulation lying near your home, or noises in the walls. Remember that squirrels can get through a hole as small as two inches in diameter. If you do find a nest the first thing to check is if there are any babies in it. Female squirrels have a litter of kits in spring; older ones usually have a second litter in summer. That means, any time from spring to late fall, there could be kits there. If you chase the mother out and seal the hole she’ll make frantic efforts to get back in, possibly causing a lot of damage. Meanwhile the babies will die, which can be smelly. If you can’t clear out the whole nest and its occupants you have two choices – wait for the babies to leave (usually at about three months old) then seal any entrances, or call in a professional exterminator. If there aren’t any kits around you can try making the nest uncomfortable using light or noise – leave a lamp with a low-heat LED bulb beside the nest, or a radio set to a 24-hour music station. Often the squirrels will get fed up and move on. Once you’ve sealed off your buildings the next stage is to prevent squirrels from spending too long in your property. Ideally you’ll deter them before they even cross your boundary, and there are a few ways to do this. Try commercial deterrent products like Animal B Gone or Shake Away; these use natural predator aromas to frighten away small animals. Home-made substitutes include ground pepper. If squirrels are stealing from your bird feeder you can also buy pepper-based products to mix with the food; birds can’t taste them, but they’ll made a rodent beat a hasty retreat. Fitting a guard to the feeder’s post is also a good idea. A more sophisticated solution that works for a lot of people is an ultrasonic repeller. These emit a very high-pitched sound that’s extremely loud but inaudible to humans. They don’t use a lot of power and can be very effective at keeping all rodent pests away. Some of them are motion-activated, so they only power up when an animal is detected. You can also rig motion sensors to a sprinkler system, which will scare away animals and water your yard at the same time. If deterrence doesn’t work a lethal solution might be required. If it’s safe and legal to do so squirrels can be shot; a shotgun will do the job very thoroughly, but a .22 or even a high-power air rifle is adequate. Squirrels are edible, so if you have a lot of them around get yourself a recipe book and a box of ammunition. Traps are another option. Get a few cage traps and bait them with peanut butter spread on crackers or small pieces of bread. When you catch a squirrel it can be relocated – release them at least three miles away to prevent them returning – or humanely killed. The absolute last resort is poisoning. There are some warfarin-based poison baits that work very well on squirrels, but baiting has downsides. Other animals can eat either the bait or dead squirrels, so this method is a serious hazard to wildlife and family pets. Poisoned squirrels also often crawl into tight spaces to die, and if one expires in your wall cavity it can get unpleasant. Squirrels can be a real nuisance, but it’s not that hard to deal with them as long as they don’t get established. There are solutions for everything from just keeping them out your loft to banishing them from your property completely. The key is to be thorough, and act as soon as you detect them. We have squirrels in our maple tree and they are snipping the ends of the branches at a 45 degree angle which fall over our lawn which we highly prize.. I have raked for a week bunch after bunch some times twice a day so the grass will not yellow. nature. Please help me solve this problem. I also have squirrels that run along my fence and then into my Cleveland Pear to play. They are very young but I am sure the mother will give birth to more. I am going to try the black pepper and put it in a plant sprayer and spray the area around the fence and tree. Hope this works as they are chewing on the bark. I have several squirrels both adults and youngsters who have been pruning two Japanese maples as well as a white birch. No only are they pruning, but using field glasses I inspected the branches of the white birch and they’ve chewed the bark right off all the way around a large branch and I fear this will eventually kill the tree. Is this correct?